Going into our third Draw & Sketch class we weren’t exactly sure what to expect, as our instructor hadn’t previously mentioned anything about the topic to be covered. 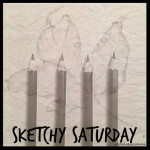 I’m glad to say that it turned out to be another excellent, information-filled session, and am thrilled to be able to share a taste of what I learned with you for this week’s Sketchy Saturday post. As with both the first and second classes, we began with some free drawing to warm up. 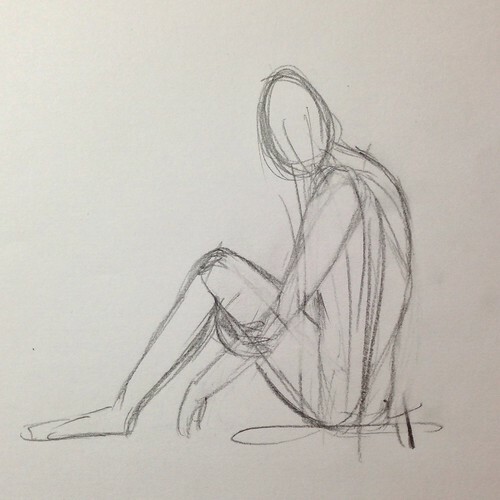 Since the subject of the evening turned out to be learning about proportions of the human body, we were tasked with doing a quick sketch of – wait for it! – a human body. 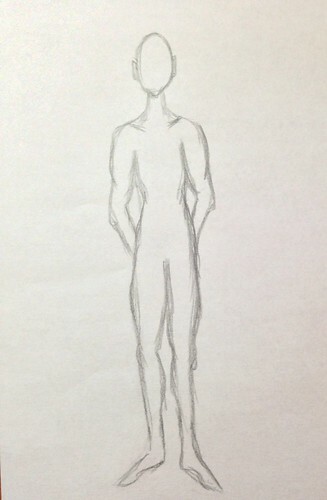 Here’s my rather scrawny, alien-looking figure. Then it was time for the lesson, where we learned that keeping a drawing of a realistic (not cartoony) adult human body proportionate is all about measuring everything against the size of the head. 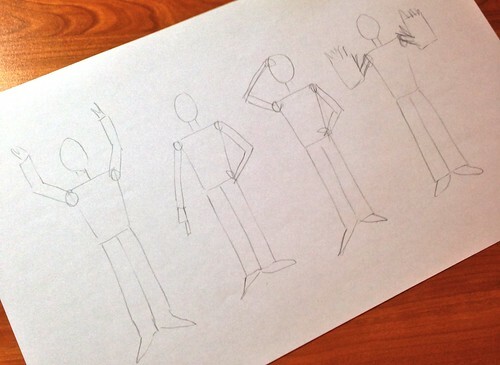 Here’s the exercise our instructor gave us to demonstrate. Neck and torso from lines 1 to 4. 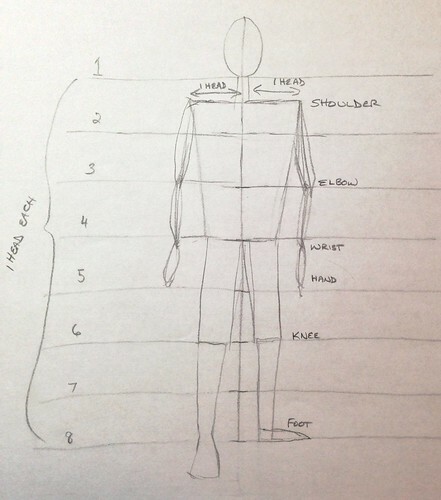 Shoulders are each one head from the vertical line. Legs (upper portion to knees) from lines 4 to 6. Legs (lower portion, knees to feet) from lines 6 to 8. Arms (upper portion, shoulder to elbow) to line 3. Arms (lower portion, elbow to wrist) from lines 3 to 4. Confusing?! Here’s my drawing, which will (hopefully) make it all a bit clearer. 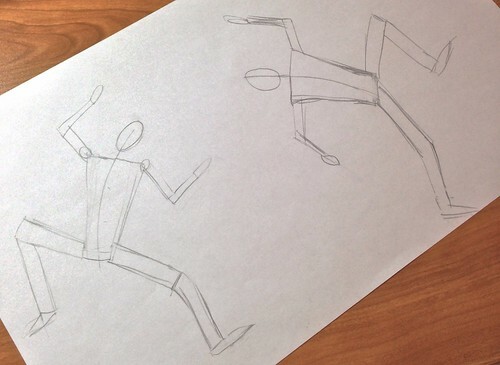 Then we did a little practice with proportions, first sketching a few quick figures and experimenting with drawing the arms in various expressive poses, then building a couple of bodies in creative (but still proportionate!) positions. And that was it for the evening. Another great class! Wonder what we’ll learn next time? I for one can’t wait to find out! Love this. Learning to draw is so mind-expanding and the best part is it changes how we see. Very true! So glad I signed up for these classes. I have been enjoying your series. Sounds so simple (I realize it is not). This course sounds like it has been well worth the time. It definitely has, Alana. So glad I’m taking it! I enjoyed reading about your drawing class. Sounds really good and very informative. I remember learning some of those things in the two drawing classes I took last winter but I’d never seen it spelled out in a handy chart with all the heads. I really like that. Makes it so clear. Thanks, Cathy! I’m hoping having it down in writing will be helpful to others (as well as helping me to remember!). Rajlakshmi recently posted… “Hook Knee on the Shoulder” … Whatttt !! Thank you! It’s a challenge to wrap your mind around at first, that’s for sure. 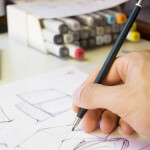 I echo the comments about the benefits of drawing class changing how we see things. And I love seeing sketch marks on drawings; it reminds me that even the masterpieces were taken a step at a time. I have been writing poetry again lately. Oiling those gears feels pretty good. Poetry is a wonderful creative outlet! 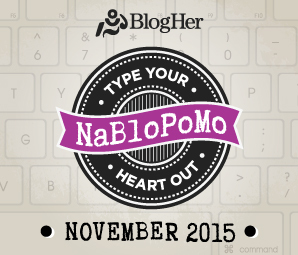 I’m hoping to do NaPoWriMo again in the new year.